Asteroids and comets are said to be leftovers from the formation of the solar system and planets. Each of these worlds offers a unique flavour of our solar system’s stages of evolution, from the nearly pristine material of the solar nebula to metallic cores of proto-planets. Continuing the food analogy, these ingredients have been cooked into the eight(ish)-planet solar system we know today, but asteroids and comets offer hints of the complete recipe and cooking process. Exploring a large sample of these bodies is key to understanding how solar systems work and planets are formed. So far we have visited about 20 asteroids and comets, with 11 different spacecraft. This represents an average cost of $250,000,000 per asteroid visit. Ground-based telescopes will remain pre-eminent in this investigation, but ground-truthing exploration with interplanetary probes (where remotely sensed information is checked against in-situ data), will help research into solar system formation. This suggests two future directions: either we reduce costs per mission or we increase the number of asteroids visited. Standardised shoe-box sized spacecraft, known as CubeSats, cost a fraction of traditional interplanetary spacecraft costs, but at the expense of reliability and performance. 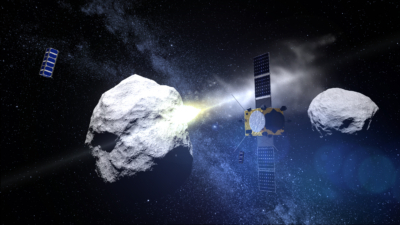 Researchers from Cranfield University, Oxford University, the Open University and OHB System AG recently proposed a new type of mission concept to the European Space Agency (ESA): a main belt asteroid tour. This consists of a spacecraft that crosses the main asteroid belt several times, and visits 10 to 20 interesting objects during its mission lifetime. Most asteroids are in orbits between Mars and Jupiter, forming the so-called main asteroid belt. Many of these reside in quiet neighbourhoods of the belt but some enter regions strongly influenced by Jupiter and Saturn’s gravities. Consequently, their orbits change rapidly (in geological terms ~1,000,000 years) and end up crossing Earth’s orbital path. An even smaller fraction of these cross the Earth’s orbital path when the Earth is actually there. This happened to the Chelyabinsk meteor, a 20-metre boulder that impacted the Earth in February 2013, and the 10-km diameter asteroid that triggered the dinosaur extinction at the end of the Cretaceous period. The Earth is often hit by small bodies. During the last two decades ground-based telescopes have made sure no dinosaur-killer asteroids are heading our way. However, we also know that a one kilometre diameter object impacts the Earth every 500,000 years and an airburst such as that of Chelyabinsk will occur every 50 years. Mitigating the asteroid impact risk means first detecting the potential Earth-threatening object, and then modifying its trajectory so it misses us. During the last decade many scientists and engineers have discussed ways to do this. Perhaps the simplest idea is the ‘kinetic impactor strategy’ which involves ramming a spacecraft into an asteroid to change its linear momentum. The next step is testing these technologies in a safe environment. This being seriously considered by NASA and ESA, with mission concepts such as the DART (Double Asteroid Redirection Test) and AIM (Asteroid Impact Mission). With the recognition of the potential need to nudge away threatening asteroids, there is also the realisation that asteroids may contain a plethora of useful resources. Asteroids certainly contain materials valued in Earth’s commodity markets, for example platinum group metals. However, to transport these materials back to Earth in a cost effective manner, the cost of space missions will have to be reduced by several orders of magnitude. Another idea, using asteroid material actually in space, holds a lot more promise because of the exponential costs of pushing anything out of the Earth’s gravity well. For example, rocket propellant could be made from volatiles (e.g. water) harvested from asteroids and comets. Orbital refuelling depots could be stationed near the top of the Earth’s gravity well (Lagrange points) and fuel interplanetary missions towards Mars and the outer planets. This would reduce the costs of sending humans to Mars by tens of billions of dollars. More recently, the concept of asteroid retrieval missions, on which a spacecraft rendezvous with an asteroid, lassos it, then hauls it back to Earth’s neighbourhood, appeared because of its synergies with science, asteroid deflection and mining. 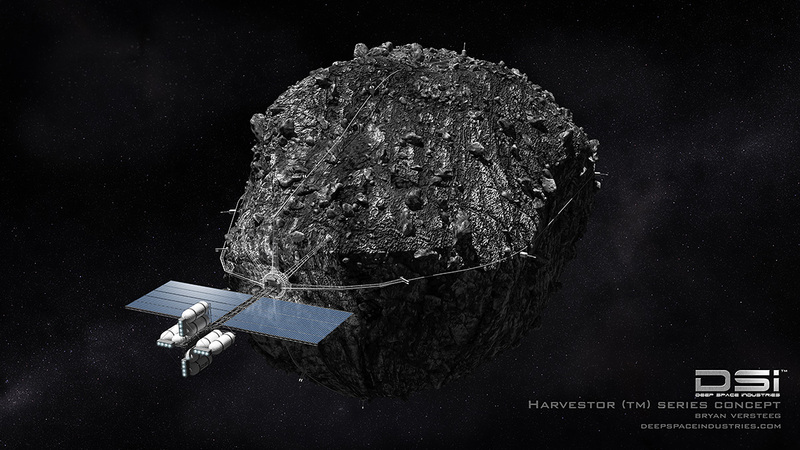 Such a mission would bring the asteroid to a more convenient location for a human crew and heavy scientific or mining equipment, while reducing time lag in communications between Earth and the spacecraft. In recent years, many studies have suggested targets for retrieval and orbits to ‘park’ these asteroids. The only space agency led effort towards an asteroid retrieval mission was however that of NASA’s Asteroid Redirect Mission. Unfortunately, this has been recently cancelled by Trump’s administration. Nevertheless, there is a real interest on asteroid mining as demonstrated by private companies (e.g. Planetary Resources and Deep Space Industries) and governmental interest (e.g. Luxembourg). Pau's research interests are in astrodynamics, mission analysis, trajectory optimization and space systems. He is particularly active in the research fields of small body missions and space macro engineering projects. He completed a PhD on asteroid deflection techniques in 2009 (University of Glasgow), followed by four years as a researcher at Strathclyde University, investigating visionary space systems. He then led a project on asteroid retrieval missions at the Universitat Politècnica de Catalunya. He became lecturer in Space Engineering at Cranfield University in 2015, where among other projects he has led CASTpath project.